Our cabin is located on 4.5 acres where you can hike in the woods and capture the magic of the abundant amount of wildlife often as close as your front door; but if fishing or canoeing is in your itinerary, enjoy just 8 miles away the New River. Whether you are sitting on the front porch, living room, loft, or having meals in the dining room, you can experience the gorgeous mountains all around you. Enjoy the picturesque view of the only castle in Grayson County. The cabin's interior consists of rustically/ modern decorated great room with wood flooring, vaulted 20 ft. ceilings and six picture windows to enjoy the breathtaking mountain view. The master bedroom includes a private bathroom with Jacuzzi & shower. The upstairs level consists of a full bathroom, and a second bedroom with a queen size bed, and bunk beds. The loft, with a queen size sofa bed, offers a cozy setting to enjoy the view. Our cabin gives you a haven to relax your, mind ~ body~ and ~ soul. New York, N.Y. 549 miles. Nearest airports: Roanoke VA 102 miles. Bathroom 1: Has a shower. The bathroom is located inside the master bedroom. Bathroom 2: Tub combination shower. Bathroom 3: Sink with mirror, and toilet. We loved the cabin and our time there. It had everything we needed. The owners are great and we will definitely go back. The view from the house is outstanding. I loved sitting on the swing at sunset, and we also enjoyed sitting on the front porch and the rockers by the windows. Beautiful. The kitchen had everything we needed and the host is great to work with ! This home is just like home.We had a peaceful stay ,everything was perfect for our stay. We had a great time, the house was neat and clean, wonderful mountain views! The house is lovely and very peaceful. Roomy, beautifully decorated and accommodates 4-6 guests easily. And the location is breathtaking. Nice little get away cabin. Very well kept, exceptionally clean and all the amenities you’ll need. We liked the seclusion and the nightly visits with deer and fawns. Very reasonably priced for all that you get. 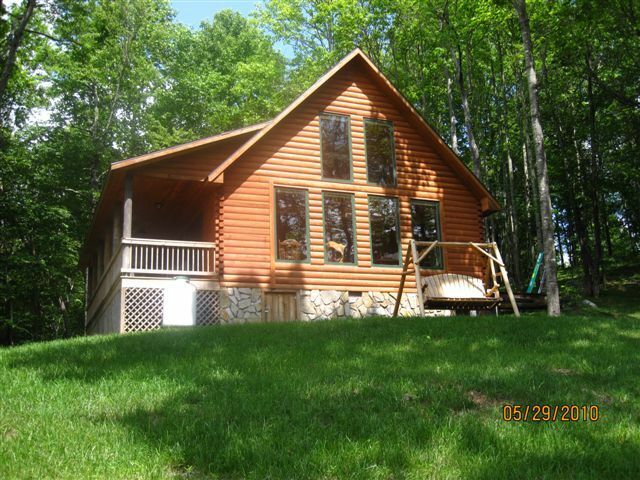 We’ve already recommended this cabin to several family members. Our cabin is situated in the Blue Ridge Highlands of southwest Virginia, right on Grayson County, just 17 miles from Mouth of Wilson. You can experience 'America’s Favorite Ride' on the Blue Ridge Parkway, just 21 miles, & Boone, NC is 59 miles from us. For those a bit more daring, you are minutes away from Jefferson Nat’l Forest, with its many trails (400 miles), waterfalls & stunning views. There you can find Mt. Rogers, the highest peak in Virginia. The New River is just 8 miles away for all kinds of activities. The small city of Galax & Independence brings to you restaurants and many recreational activities.